What Kinds of Stone Tools Do Archaeologists Recognize? Stone tools are the oldest surviving type of tool made by humans and our ancestors--the earliest date to at least 1.7 million years ago. It is very likely that bone and wooden tools are also quite early, but organic materials simply don't survive as well as stone. 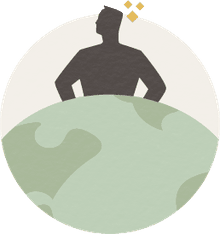 This glossary of stone tool types includes a list of general categories of stone tools used by archaeologists, as well as some general terms pertaining to stone tools. Artefact (or Artifact): An artifact (also spelled artefact) is an object or remainder of an object, which was created, adapted, or used by humans. The word artifact can refer to almost anything found at an archaeological site, including everything from landscape patterns to the tiniest of trace elements clinging to a potsherd: all stone tools are artifacts. Geofact: A geofact is a piece of stone with seemingly human-made edges that resulted from naturally broken or eroded, as opposed to one that was broken by purposeful human actions. If artifacts are products of human behaviors, geofacts are products of natural forces. Distinguishing between artifacts and geofacts can be tricky. Lithics: Archaeologists use the (slightly ungrammatical) term 'lithics' to refer to all artifacts made of stone. Assemblage: Assemblage refers to the entire collection of artifacts recovered from a single site. An artifact assemblage for an 18th century shipwreck might include artifact groups such as arms, navigational equipment, personal effects, stores; one for a Lapita village might include stone tools, shell bracelets, and ceramics; one for an Iron Age village might include iron nails, fragments of bone combs and pins. Material Culture: Material culture is used in archaeology and other anthropology-related fields to refer to all the corporeal, tangible objects that are created, used, kept and left behind by past and present cultures. A chipped stone tool is one that was made by flint knapping. The tool maker worked a piece of chert, flint, obsidian, silcrete or similar stone by flaking off pieces with a hammerstone or an ivory baton. Arrowheads / Projectile Points: Most people exposed to American western movies recognize the stone tool called an arrowhead, although archaeologists prefer the term projectile point for anything other than a stone tool fixed to the end of a shaft and shot with an arrow. Archaeologists prefer to use 'projectile point' to refer to any object affixed to a pole or stick of some kind, which has been fashioned for use as a weapon, out of stone, metal, bone, or other material. 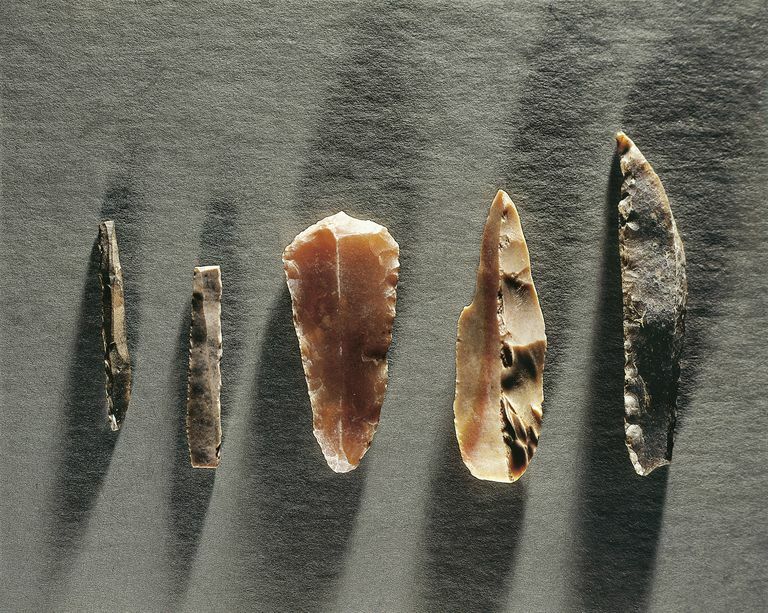 One of the oldest tools of our sad race, the projectile point was (and is) primarily used to hunt animals for food; but was also used to fend off enemies of one sort or another. Handaxes: Handaxes, often referred to as Acheulean or Achuelian handaxes, are the oldest recognized formal stone tools, used between 1.7 million and 100,000 years ago. Crescents: Crescents (sometimes called lunates) are moon-shaped chipped stone objects which are found fairly rarely on Terminal Pleistocene and Early Holocene (roughly equivalent to Preclovis and Paleoindian) sites in the Western United States. Blades: Blades are chipped stone tools which are always at least twice as long as they are wide with sharp edges on the long edges. Drills/Gimlets: Blades or flakes which have been retouched to have pointed ends may be drills or gimlets: they are identified by the usewear on the working end and are often associated with bead making. Scrapers: A scraper is a chipped stone artifact that has been purposefully shaped with one or more longitudinal sharp edges. Scrapers come in any number of shapes and sizes, and may be carefully shaped and prepared, or simple a pebble with a sharp edge. Scrapers are working tools, made to help clean animals hides, butcher animal flesh, process plant material or any number of other functions. Burins: A burin is a scraper with a steeply notched cutting edge. Denticulates: Denticulates are scrapers with teeth, that is to say, small notched edges that protrude out. Turtle-Backed Scrapers: A turtle backed scraper is a scraper that in cross-section looks like a turtle. One side is humped like a turtle's shell, while the other is flat. Often associated with animal hideworking. Tools made from ground stone, such as basalt, granite and other heavy, coarse stones, were pecked, ground and/or polished into useful shapes. Adzes: An adze (sometimes spelled adz) is a wood-working tool, similar to an axe or hachet. The shape of the adze is broadly rectangular like an axe, but the blade is attached at a right-angle to the handle rather than straight across. Celts (Polished Axes): A celt is a small axe, often beautifully finished and used to shape wooden objects. Grinding Stones: A grinding stone is a stone with a carved or pecked or ground indentation in which domesticated plants such as wheat or barley or wild ones such as nuts and were ground into flour. Flint Knapping: Flint knapping is the process by which stone (or lithics tools were and are today made. Hammerstone: A hammerstone is the name for an object used as a prehistoric hammer, to create percussion fractures on another object. Debitage: Debitage [pronounced in English roughly DEB-ih-tahzhs] is the collective term used by archaeologists to refer to the sharp-edged waste material left over when someone creates a stone tool (knaps flint). Atlatl: The atlatl is a sophisticated combination hunting tool or weapon, formed out of a short dart with a point socketed into a longer shaft. A leather strap hooked at the far end allowed the hunter to fling the atlatl over her shoulder, the pointed dart flying off in a deadly and accurate manner, from a safe distance. What Were the First Tools Made on Planet Earth For? Were crescent-shaped arrowheads used to hunt waterfowl? What Great Leap Forward Does the Levallois Technique Represent? What Ancient Hunting Strategies Did Our Ancestors Use? Why Do Archaeologists Call Arrowheads Projectile Points?